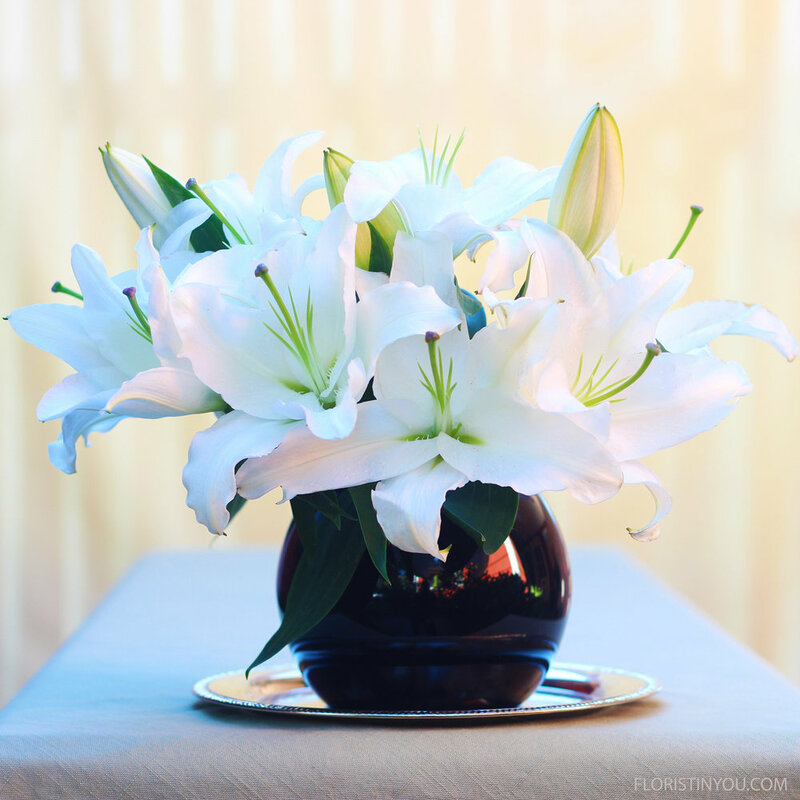 This white lily arrangement is easy with the help of a floral frog, a plastic fork and a Q-tip. A floral frog is a round or rectangular weight with a flat underside that sits at the bottom of a vase . It has brass spikes to hold floral stems and branches in place, and has traditionally been used in Ikebana, the Japanese art of floral arranging. Take my word for it, for this arrangement use a flower frog. I tried a grid of water proof tape first and it didn’t work; the stems were too top heavy. They fell right out of the vase, head first. Oops. When you use the floral frog, instead of cutting the stems at a sharp angle as usual, cut them flat so you can secure them into the floral frog. 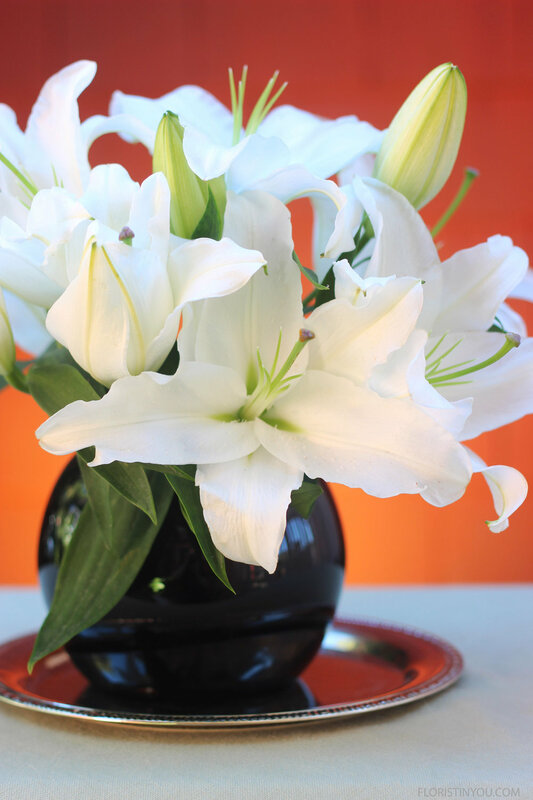 Some of the closed lilies will open up in the next few days and as the older lilies begin to darken, snip them off with your shears. By the way, this was the first time that I used my Bonsai scissors (purchase here) and I love them. They are of a very high quality. They have 2 inch steel blades and a sharp cut. Here are a couple of other tips. 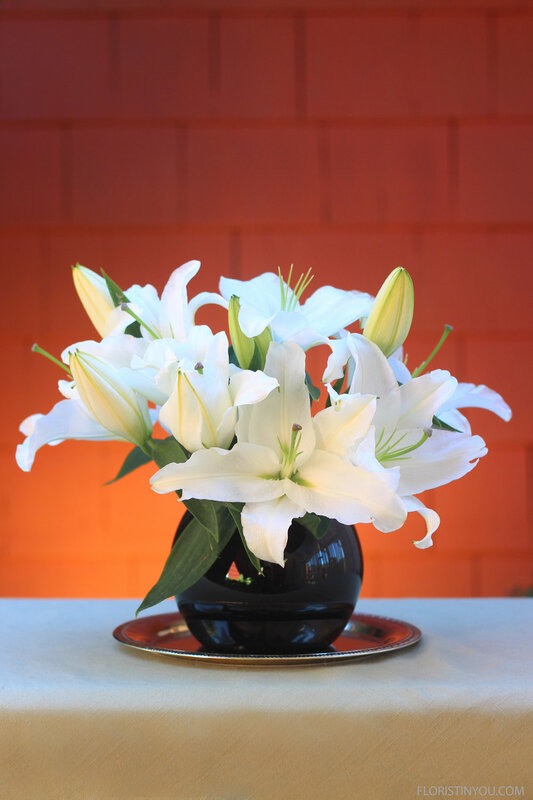 Floral tip: Remove the stamen of the lilies with a plastic fork, holding the lily over a garbage can. The orange from the stamen will stain fabric and even the skin on your fingers. 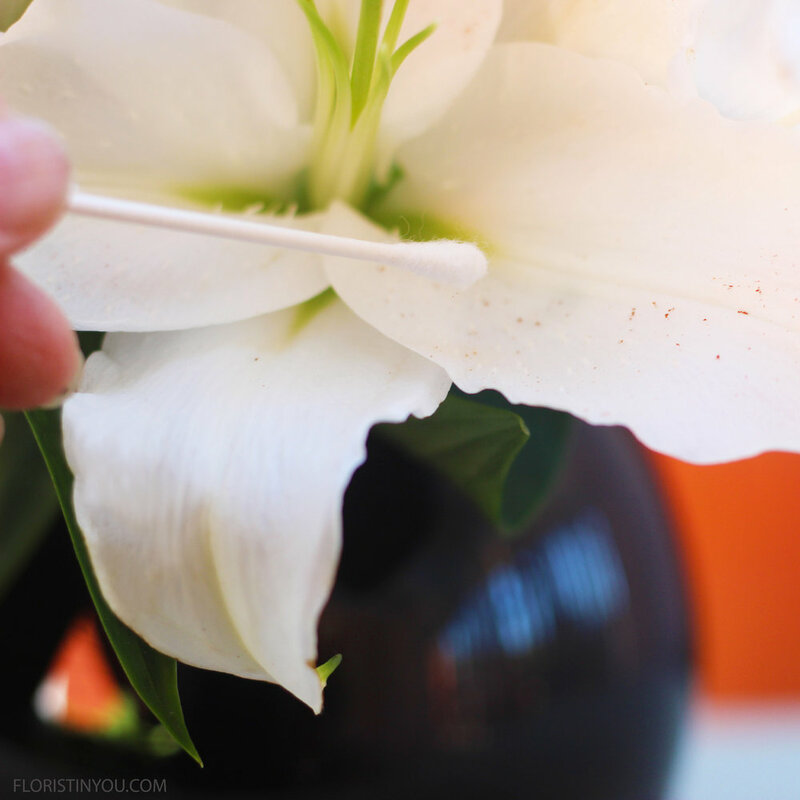 Floral tip: Use a Q-tip to gently remove any orange that falls onto the lily petals. If you have your floral frog, flowers and vase, let’s begin. 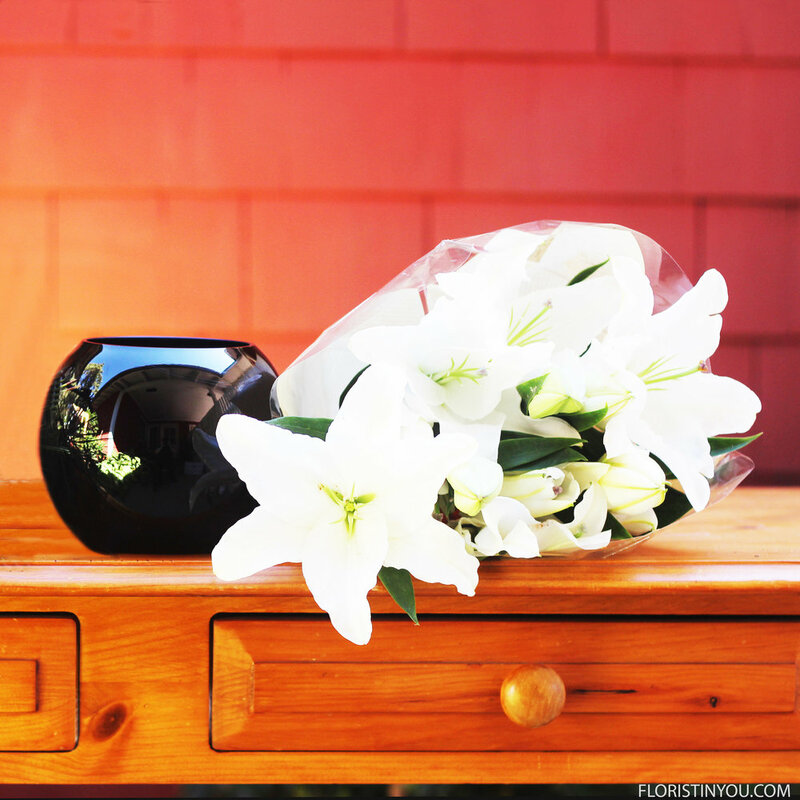 Here’s the vase and the lilies. 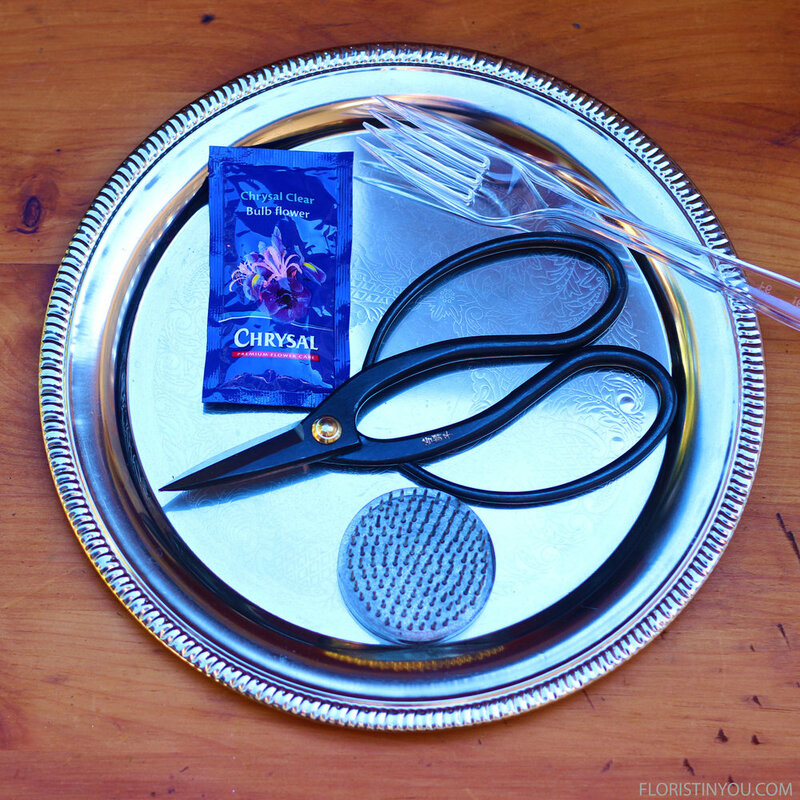 Remove stamens with a plastic fork. Push stems into floral frog in the way you want them arranged. Add packet of flower food. Carefully lower frog into the vase. Use a Q-tip. Gently pick up any orange from stamens that fell on leaves. 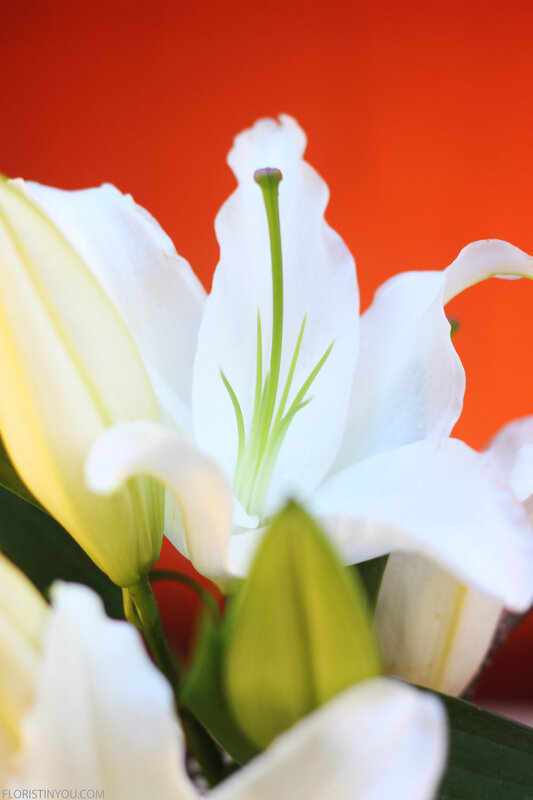 The closed lilies will open up over the next few days.